Konamic Tennis (コナミック テニス, Konamic Tennis?) 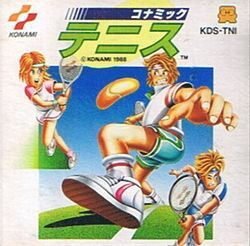 is a tennis game developed and published by Konami for the Famicom Disk System in 1988. It is part of a long line of Konami sports games made specifically for the Famicom and the Famicom Disk System, which had previously used the term "Exciting" to signify its Konami status (e.g. Exciting Baseball, Exciting Basket). Instead, this and future Konami sports games for the system would be released under the "Konamic" label; a combination of "Konami" and "dynamic". Konamic Tennis follows a similar design philosophy to many other tennis games, depicting the action from behind the serving player's side of the court. It follows the rules of the sport precisely, with a single game usually ending after four successful volleys (scored as 15, 30, 40 and Game) and the first to win six games deciding a set. Players can choose between a single set match or a longer 3-set match. They can also play in a tournament or a single one-on-one game with a CPU (or human) opponent of their choosing. One feature Konamic Tennis introduces to the genre is that of the serving view, shown as an inset whenever a player serves the ball to start a game. The goal is to hit the ball at precisely the right moment to serve an excellent shot; too early or too late will cause the player to either hit the net or send the ball too far, or simply not hit the ball at all. In all these cases, it counts as a foul and the player has one more chance to correctly serve the ball, otherwise points are awarded to the opponent. This page was last edited on 26 June 2014, at 01:58.